Rank and organization: Private First Class, U.S. Marine Corps. Born: 2 February 1920, Middleborough, Kentucky. Citation: For conspicuous gallantry and intrepidity at the risk of his life above and beyond the call of duty as an automatic rifleman serving with the 2d Battalion, 3d Marines, 3d Marine Division, in action against enemy Japanese forces on the Asan-Adelup Beachhead, Guam, Marianas Islands on 22 July 1944. Suddenly taken under fire by two enemy machineguns not more than 15 yards away while clearing out hostile positions holding up the advance of his platoon through a narrow gully, Pfc. Mason, alone and entirely on his own initiative, climbed out of the gully and moved parallel to it toward the rear of the enemy position. Although fired upon immediately by hostile riflemen from a higher position and wounded repeatedly in the arm and shoulder, Pfc. Mason grimly pressed forward and had just reached his objective when hit again by a burst of enemy machinegun fire, causing a critical wound to which he later succumbed. With valiant disregard for his own peril, he persevered, clearing out the hostile position, killing five Japanese, wounding another and then rejoining his platoon to report the results of his action before consenting to be evacuated. His exceptionally heroic act in the face of almost certain death enabled his platoon to accomplish its mission and reflects the highest credit upon Pfc. Mason and the U.S. Naval Service. He gallantly gave his life for his country. Rank and organization: Private First Class, U.S. Marine Corps Reserve, 3d Battalion, 3d Marines, 3d Marine Division. Place and date: Asan-Adelup beachhead, Guam, Marianas Islands, 21 -22 July 1944. Entered service at: Kentucky. Born: 3 March 1923, Henderson, Ky. Citation: For conspicuous gallantry and intrepidity at the risk of his life above and beyond the call of duty while serving as squad leader with a mortar section of a rifle company in the 3d Battalion, 3d Marines, 3d Marine Division, during action against enemy Japanese forces on the Asan-Adelup beachhead, Guam, Marianas Islands, 21 -22 July 1944. When the section leader became a casualty under a heavy mortar barrage shortly after landing, Pfc. Skaggs promptly assumed command and led the section through intense fire for a distance of 200 yards to a position from which to deliver effective coverage of the assault on a strategic cliff. Valiantly defending this vital position against strong enemy counterattacks during the night, Pfc. Skaggs was critically wounded when a Japanese grenade lodged in his foxhole and exploded, shattering the lower part of one leg. Quick to act, he applied an improvised tourniquet and, while propped up in his foxhole, gallantly returned the enemy's fire with his rifle and handgrenades for a period of 8 hours, later crawling unassisted to the rear to continue the fight until the Japanese had been annihilated. Uncomplaining and calm throughout this critical period, Pfc. Skaggs served as a heroic example of courage and fortitude to other wounded men and, by his courageous leadership and inspiring devotion to duty, upheld the high traditions of the U.S. Naval Service. 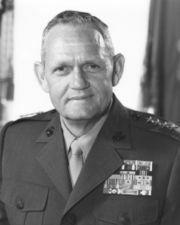 Captain Louis Hugh Wilson Jr.
Rank and organization: Captain, U.S. Marine Corps, Commanding Rifle Company, 2d Battalion, 9th Marines, 3d Marine Division. Place and date: Fonte Hill, Guam, 25-26 July 1944. Entered service at: Mississippi. Born: 11 February 1920, Brandon, Mississippi. Citation: For conspicuous gallantry and intrepidity at the risk of his life above and beyond the call of duty as commanding officer of a rifle company attached to the 2d Battalion, 9th Marines, 3d Marine Division, in action against enemy Japanese forces at Fonte Hill, Guam, 25-26 July 1944. Ordered to take that portion of the hill within his zone of action, Capt. Wilson initiated his attack in mid-afternoon, pushed up the rugged, open terrain against terrific machinegun and rifle fire for 300 yards and successfully captured the objective. Promptly assuming command of other disorganized units and motorized equipment in addition to his own company and one reinforcing platoon, he organized his night defenses in the face of continuous hostile fire and, although wounded three times during this 5-hour period, completed his disposition of men and guns before retiring to the company command post for medical attention. Shortly thereafter, when the enemy launched the first of a series of savage counterattacks lasting all night, he voluntarily rejoined his besieged units and repeatedly exposed himself to the merciless hail of shrapnel and bullets, dashing 50 yards into the open on one occasion to rescue a wounded Marine lying helpless beyond the frontlines. Fighting fiercely in hand-to-hand encounters, he led his men in furiously waged battle for approximately 10 hours, tenaciously holding his line and repelling the fanatically renewed counterthrusts until he succeeded in crushing the last efforts of the hard-pressed Japanese early the following morning. Then organizing a 17-man patrol, he immediately advanced upon a strategic slope essential to the security of his position and, boldly defying intense mortar, machinegun, and rifle fire which struck down 13 of his men, drove relentlessly forward with the remnants of his patrol to seize the vital ground. By his indomitable leadership, daring combat tactics, and valor in the face of overwhelming odds, Capt. Wilson succeeded in capturing and holding the strategic high ground in his regimental sector, thereby contributing essentially to the success of his regimental mission and to the annihilation of 350 Japanese troops. His inspiring conduct throughout the critical periods of this decisive action sustains and enhances the highest traditions of the U.S. Naval Service. Rank and organization: Private First Class, U.S. Marine Corps Reserve. Born: December 1921, Derby, Conn. Accredited to: Illinois. Citation: For conspicuous gallantry and intrepidity at the risk of his life above and beyond the call of duty while serving with the 1st Battalion, 9th Marines, 3d Marine Division, during the Battle of Finegayen at Guam, Marianas, on 3 August 1944. When his rifle platoon was halted by heavy surprise fire from well-camouflaged enemy positions, Pfc. Witek daringly remained standing to fire a full magazine from his automatic at point-blank range into a depression housing Japanese troops, killing 8 of the enemy and enabling the greater part of his platoon to take cover. During his platoon's withdrawal for consolidation of lines, he remained to safeguard a severely wounded comrade, courageously returning the enemy's fire until the arrival of stretcher bearers, and then covering the evacuation by sustained fire as he moved backward toward his own lines. With his platoon again pinned down by a hostile machinegun, Pfc. Witek, on his own initiative, moved forward boldly to the reinforcing tanks and infantry, alternately throwing handgrenades and firing as he advanced to within 5 to 10 yards of the enemy position, and destroying the hostile machinegun emplacement and an additional 8 Japanese before he himself was struck down by an enemy rifleman. His valiant and inspiring action effectively reduced the enemy's firepower, thereby enabling his platoon to attain its objective, and reflects the highest credit upon Pfc. Witek and the U.S. Naval Service. He gallantly gave his life for his country.